A group of renovation contractors and designers in Montreal who come together to carry out modern or classic style kitchen and bathroom renovation of your home. Whether it is to do a little retouching of the interior design or a full kitchen or bathroom renovation Montreal, our group of experienced RBQ licensed general contractors covers an area of more than 100 km around Montreal. The group has carried out hundreds of projects and is led by Mr. Daniel Dargis, Engineer and general contractor since 1989. The field of kitchen and bathroom renovation requires experienced entrepreneurs, meticulous perfectionists who have at heart a job well done. Complete kitchen and bathroom renovation is an investment that will give value to your home by allowing you to enjoy your home by adding convenience, comfort and design to it. 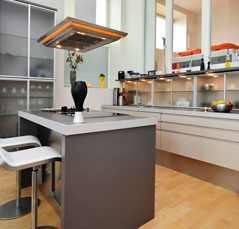 Whether it is for a kitchen renovation in Montreal, for replacing kitchen cabinets, new repainting of a bathroom or a ceramics change, transforming or building an entire kitchen or bathroom completely, we can help you. We do everything from A to Z renovation Montreal. First we meet with you to take your ideas, your budget and we offer you a range of clear and detailed services which may include: drawings & plans, specifications, interior design and kitchen or bathroom renovation Montreal. Then a work schedule is established and we do the turnkey work taking care of everything. 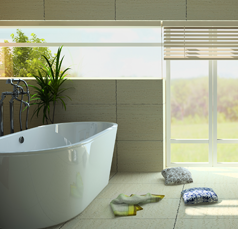 You will gradually see your kitchen or bathroom transform into the space of your dreams. An interior designer will meet you at your home and prepare some sketches in color to better visualize the renovation Montreal project. He will show you samples of materials and take care of searching in the store in order to find the counters, cabinets, ceramics and materials that best suit your tastes and your budget. 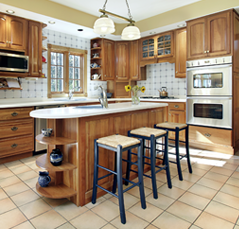 A few meetings may be necessary before selecting the ideal proposal of your dream kitchen. Throughout the creation of the design, the designer's work is done in cooperation and under verification of a general contractor to ensure that the design meets the feasibility corresponding to your budget. You participate throughout the creation of the kitchen or bathroom choosing the proposals of the interior designer. Our offices are located near the Olympic Stadium in Montreal. Our group of renovation contractors covers a wide area around the region of Montreal: Laval, Blainville, Terrebonne, Mirabel, Saint-Jerôme, Kirkland and the West Island, Vaudreuil, La Prairie, Saint-Hubert, Longueuil , Brossard, Boucherville, Beloeil, Repentigny, Châteauguay, Mercier. We are experts in renovation in Montreal. Do not hesitate to contact us!